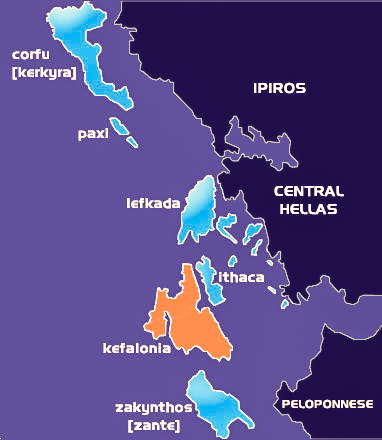 The island of Kefalonia, also known under the name of Cephallenia, Cephallonia, Kefallinia, or Kefallonia ( old Greek :Κεφαλληνία ; Modern Greek : Κεφαλλονιά or Κεφαλονιά, is the largest of the Ionian islands in Western Greece with a surface of 906 km2. It is located between the island of Zakynthos in the south, the island of Lefkada (Lefkas) in the north and the island of Ithaca in the north-east. 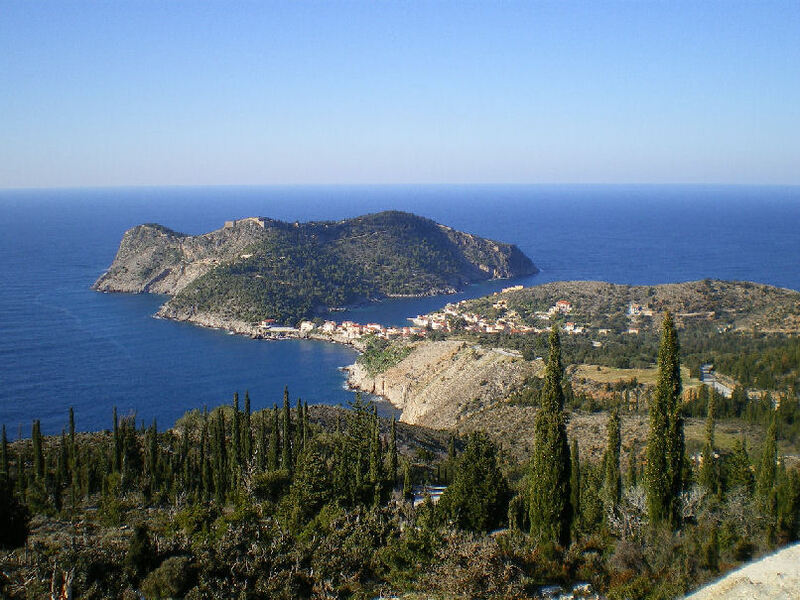 The island has been given the name of the mythological figure Kefalos. The island is covered by a dense vegetation and offers a great range of landscapes of a rare beauty, including outstanding by superb beaches of which a good number are inaccessible, as well as spectacular caves. The highest mountain of Kefalonia is the Ainos mountain which reaches 1628m; at the west-north-west are the Paliki mountains. The forest is exploited on some sites of the island. Forest fires were current during the Nineties, which encouraged the public authorities to set up a monitoring service so that we xould not have the same wave of fires as that which occurred in 2006 and 2007 in the Peloponnese. Agriculture is dominated by the growing and the production of olives. The majority of the production takes place in the plains that cover less than 15% of the island; the growing relates to mainly the goats because of the mountainous character of the island. Kefalonia has an airport, the airport of Kephallinia (Kefallinia, Argostolion: EFL), located at approximately 10 kilometers from Argostoli. Scheduled flights connect the island to Athens, There are also charters coming from certain European cities (London for example). 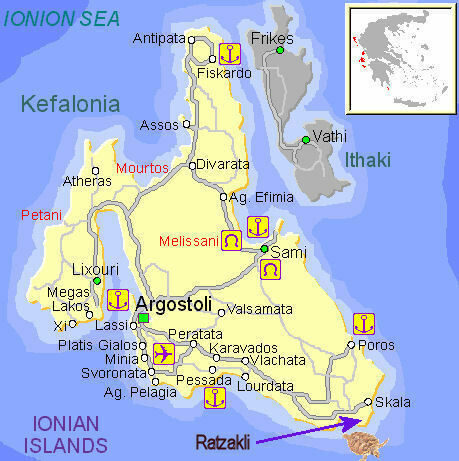 Actually, each Greek island, since the Odyssey, has its own characteristics. Kefalonia, is thus since time immemorial "the island of the insane ones", a reputation that its inhabitants are the first to maintain, Definitely a trick for better protecting itself from mass tourism. In reality the inhabitants of the island do not miss a trick. According to tradition, Gerasimos (1506-1579), who is patron saint of the island, cured many inhabitants touched by madness. Today still, two festivals punctuate life at the monastery of Saint-Gerasimos located in the South of the island : on August 16 (day commemorating the death of Gerasimos) and on October 20 (date of the transfer of his body to its new residence). At the time of the procession which proceeds along a large avenue bordered by plane trees, what usually happens is the people touched by mental disorders lie down under its passage in the hope of a miraculous cure. Five ports serve the island. Argostoli (west) receives large cruise ships. Sami (Est) is the busiest port. 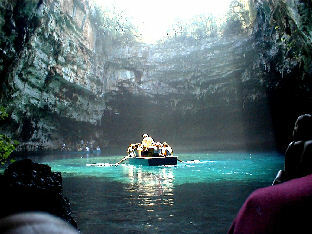 It connects the islands of Lefkada ans Ithaca, and with the continental Greece. In the summer some ferries come directly from Italy, especially from Bari and Brindisi. Poros, (south), has ferries to Kyllini (Peloponnese). Homer proposes 26 descriptions of places on the island as being the house of Ulysses, but these descriptions do not correspond to the modern island of Ithaca. It was suggested that Ithaca about which Homer speaks is not the same place as the modern island of Ithaca and one supposes that Kefalonia and Ithaca would have been formerly united because Homer describes Ithaca as being much larger than now, the geographical data also suggest that the islands had been connected formerly, although no scientific element currently proves it. This small organization protects the natural environment of Kefalonia and concentrates its activities on the safeguarding of the turtles (caretta caretta), Kefalonia being an important site of reproduction. The association hopes by its action to stop the decline of the population of turtles. 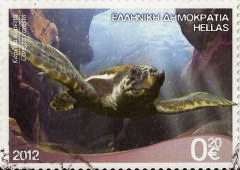 It has also engaged a program of education to inform the population on the life of the turtles. To assist them in their work, this organization accepts a great number of volunteers each summer who can thus spend useful holidays and then leave again with unforgettable memories. 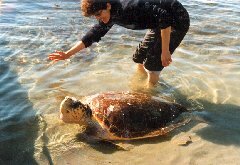 The Katelios Group was founded in 1993 and has observed, monitored and recorded the feeding and breeding behavior of the turtles nesting on these sandy beaches. Incorporating a conservation program to promote the protection of these main nesting areas from any rapid development, most are already stable and therefore offer the females a safe nesting ground to lay their eggs. The Group currently monitors the nesting behaviour of the turtles on the main beach at Mounda Bay (Ratzakli). With the data collected it is being used to produce a conservation plan in an effort to protect the turtles and their habitats throughout the island. Research work starts in the spring, with the beaches firstly being cleaned of waste deposits left over the winter months. The beach is then mapped and marked, allowing the exact positioning of each nest to be recorded. The nesting season is June to August during which time the beach is monitored nightly from 10.00 pm. to 6.00 am. where every emerging turtle from the sea is recorded. This includes the length and width of the shell and the health of each female. The nest position, and the number of eggs in each clutch, each female can lay between 80 and 180 eggs. The tag numbers are recorded and turtles without tags are marked. After an incubation period of around 55-60 days, the hatchlings emerge late at night or early hours of the morning and make the precarious journey to sea. These tiny creatures sense the right direction in which to go because they are attracted to bright light. At night, the sea is the brightest area with the moonlight reflecting off the water. Each hatchling makes this journey, often precarious, over lots of obstacles such as sandcastles, holes and the chance of being eaten by seabirds before they reach the sea, so this mad dash is twofold, firstly to strengthen their muscles and secondly survival. With the help and support of the local fisherman and compensation for any damaged nets, the support and co-existence of people and turtle, locals and tourists alike is giving valuable support and is essential in the protection of these nesting grounds. If landscapes of a rough and austere beauty touch you, then take the road which, at the beginning of Argostóli, leads to the mount Ainos. This giant emerges suddenly from a thick forest of black fir trees whose characteristics have branches that rise upwards. These trees exist only here, a national park has been created to protect them. If you have suitable footwear, you can leave your car at the location of the aerials and start to climb to the top which is over a rochy terrain. 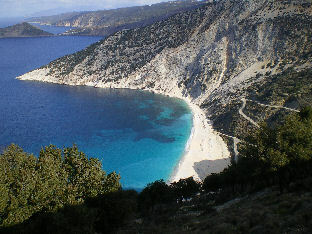 The beach of Myrtos is regarded as one of most beautiful of Greece. High white cliffs with caves overhang its turquoise water. To start from there, the cliff road offers sights that are sublime on the Ionian sea and makes it possible to see a number of beaches that are accessible only by boat. But the most beautiful yet to come is the village of fishermen of Assos, nestled into the root of a peninsula whose top is crowned with a Venetian fortress of the 16th C. To reach it, the road which overlooks the sea skirts ancient low walls formerly used for the culture of vines. Assos appears then, ansmall flowered port where peasants sell a delicious thyme honey. 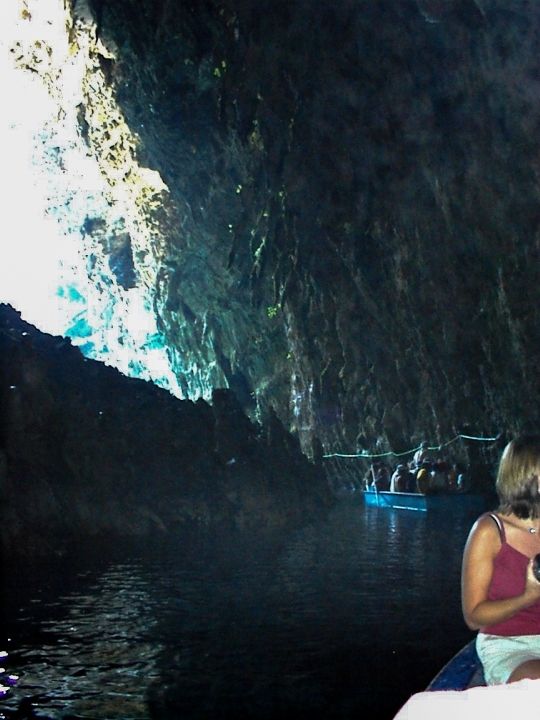 At 2 km to the south-west of Sámi, the cave of Drogarati is one of the curiosities of kefalonia. A staircase of 166 steps will take you into an immense decorated fresh room of enormous stalagmites. Acoustics are very good there and in summer concerts are organized there. 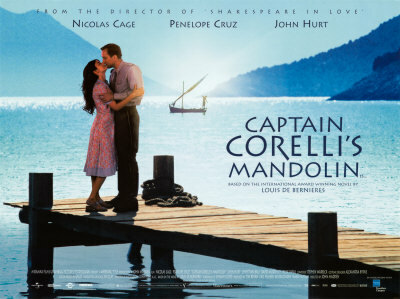 The story is set during the Second World War, on the island of Kefalonia. It is about the meeting between a young Italian master with Dr. Iannis and daughter Pelagia during the Italo-German occupation in Greece. In summer strong heats are often compensated by a breeze which starts to blow in the middle of the afternoon and makes it possible to have much fresher evenings than in Athens. However, during the heat waves which last several days, do not be astonished to see the thermometer recording 40°c or more. The average temperature in summer is 26.5°c but, in general, for half the day it is easily between 28 and 35°c. The high temperatures dominate almost continuously from May to October to allow the earth to retain its heat, resulting in short and mild winters. The wind (Bora) and the rain refresh the air notably. 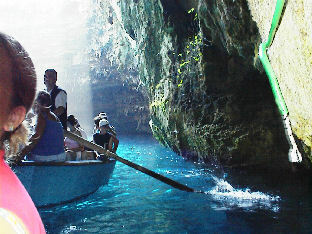 Kefalonia is an island and the winter storms can prevent the sea traffic during one or two days. Sometimes at night the temperatures can fall between 0 and 5°c in December and January. Autumn and spring are in general very pleasant, although strong downpours are frequent. As soon as the sun rises, the temperatures climb. 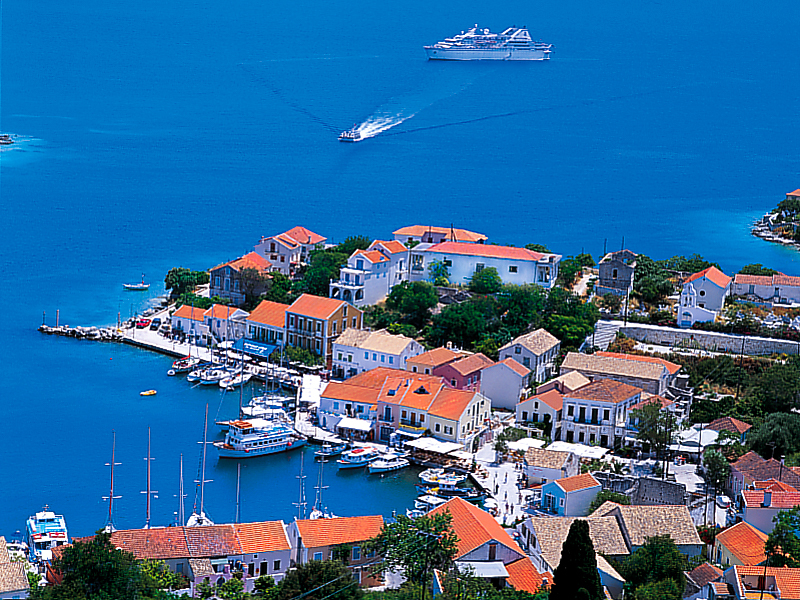 July and August are the months most attended by the Greek and foreign tourists. It's often very hot. If you are not been on bathing and if you are not dependent on school vacations, then why not benefit from the average season as sunny as its prices are interesting! 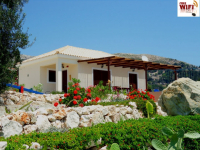 May and June has the advantage of offering a good compromise between sun and wellbeing and of making it possible to visit Kefalonia green and flowered, while September and October make it possible to benefit from a mild end of summer. If you attach more importance to the beauty of the landscapes and meeting with the local people rather than with “idleness”, then choose without hesitating the out-season period. Your camera will accompany you everywhere and you will bring back unforgettable images from there for you. April and November are perfect to feel the wind which dishevels refreshes you and to see splendid sunsets. From December to March, the eyes turn to the Ainos mount which is sometimes covered with snow. The panorama is then breathtaking: The mountain at the seaside!